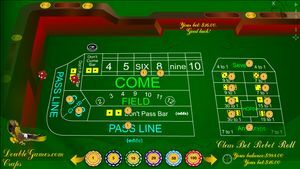 Soft14: Classic Craps - Classic Craps with an excellent graphics and huge winnings is waiting for you! The designers of this game invite you to the place where you feel freedom and happiness. It is near the table of Classic Craps. The object of craps is to predict the outcome of a roll of the dice. Your winning depends on them completely. Craps is one of the most exciting table games played in casinos today. It is one of the few truly social games and one of the few played with dice. While the game's apparent complexity and odd jargon may, at first be intimating you will find the game of Craps to be enjoyable and rewarding. In this game no one says, "He had a lot of money, but was foolish enough to dice most of it away." Playing Craps can be as simple as complicated as you choose to make it. There are an extensive array of betting options available but the player only needs to understand a few of them to play the game, have fun and win! Classic Craps with its excellent graphics, pleasant music and huge winnings is waiting for you!